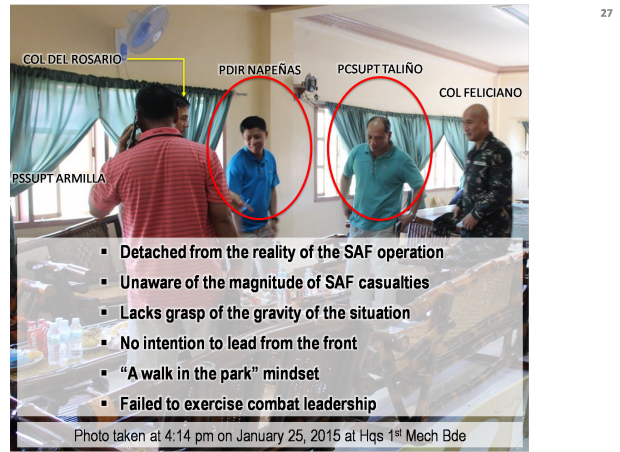 Napeñas, Taliño smiling while SAF men being pinned down-AFP - News - Kuro - Tsismis Pa More! The Armed Forces of the Philippines (AFP) dropped a major bombshell in the Senate hearing today on the Mamasapano incident showing Special Action Force Chief Getulio Napeñas and Deputy Director Noli Taliño smiling while meeting with their AFP counterparts at the height of the gunfight between SAF commandos and Moro rebels in Maguindanao. What are your thoughts on this? Suggest new topics for Kuro!